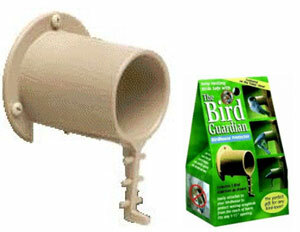 The Bird Guardian was designed for all cavity-nesting backyard birds. Patented, tested and approved by naturalists, this one-of-a-kind product is constructed of strong durable plastic made to last year after year. Each year scientific studies and tests continue to prove this product superior in the battle to save our endangered backyard songbirds. 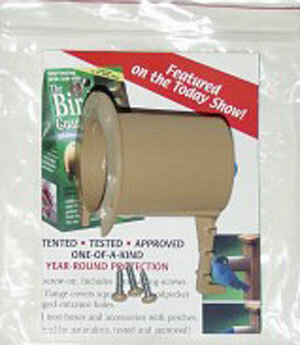 The Bird Guardian fits birdhouse openings from 1" through 1-1/2". The newest Bird Guardian features a natural look attractive to birds and homeowners alike. 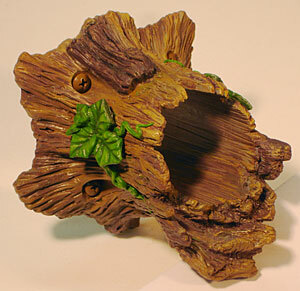 Each order includes two Natural Bird Guardians. A $31.00 value for only $29.95! 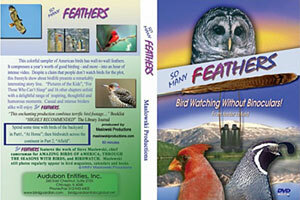 Special offer on the "So Many Feathers DVD"
If you prefer to order with Money Order, Cashiers Check, or Check, click here for a printable order form to mail. US & Foreign pat. pending. The Original Bird Guardian in colorful gift box. View our full list of order options. Available as a pair for $15.45. 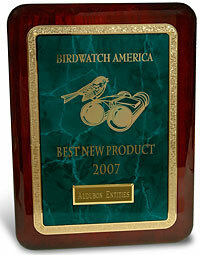 15 years of award winning footage of songbirds in their natural surroundings! 60 minutes of fun and relaxation! Special value, limited time only -- $11.50! with any order. Click here to view a short clip and images from the movie. You will also be able to take advantage of our special offer and purchase the DVD for only $11.50 with any Bird Guardian order. Order at the special $11.50 price. Order just the DVD at the standard price of $19.95.